The village of Saint-Hippolyte is a small french village located north east of France. 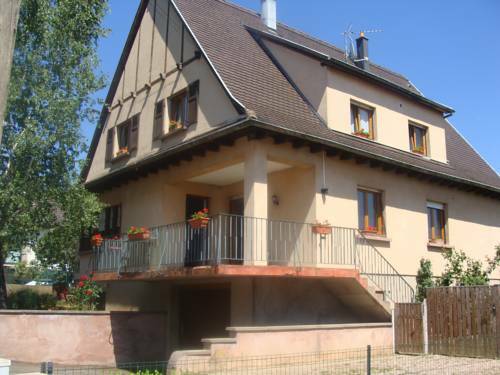 The town of Saint-Hippolyte is located in the department of Haut-Rhin of the french region Alsace. The town of Saint-Hippolyte is located in the township of Ribeauvillé part of the district of Ribeauvillé. The area code for Saint-Hippolyte is 68296 (also known as code INSEE), and the Saint-Hippolyte zip code is 68590. The altitude of the city hall of Saint-Hippolyte is approximately 240 meters. The Saint-Hippolyte surface is 17.86 km ². The latitude and longitude of Saint-Hippolyte are 48.232 degrees North and 7.369 degrees East. Nearby cities and towns of Saint-Hippolyte are : Orschwiller (67600) at 1.38 km, Rodern (68590) at 1.45 km, Rorschwihr (68590) at 1.81 km, Bergheim (68750) at 3.16 km, Kintzheim (67600) at 3.24 km, Thannenkirch (68590) at 4.84 km, Guémar (68970) at 5.38 km, Châtenois (67730) at 5.60 km. The population of Saint-Hippolyte was 1 060 in 1999, 1 050 in 2006 and 1 049 in 2007. 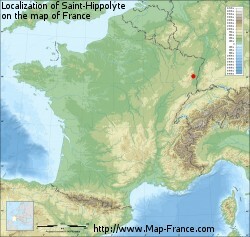 The population density of Saint-Hippolyte is 58.73 inhabitants per km². The number of housing of Saint-Hippolyte was 494 in 2007. These homes of Saint-Hippolyte consist of 409 main residences, 43 second or occasional homes and 42 vacant homes. This is the last weather forecast for Saint-Hippolyte collected by the nearest observation station of Ribeauvillé. The latest weather data for Saint-Hippolyte were collected Wednesday, 24 April 2019 at 09:50 from the nearest observation station of Ribeauvillé.